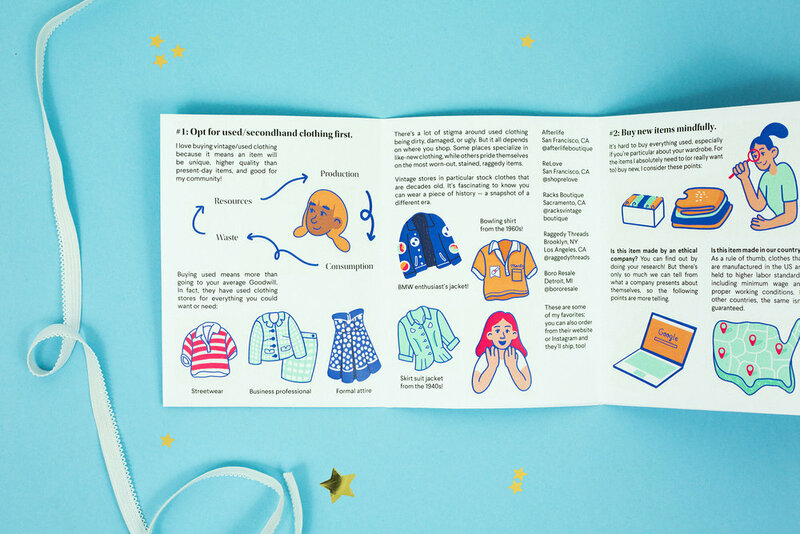 This is an informational post on my latest zine, My Ethical Clothing Guidebook! If this is your first time reading, hello!, I'm a graphic designer and illustrator based in Hayward, CA. Environmental justice is a huge passion of mine, starting from my early work at UC Davis running a thrift shop of my own! From there, I became fascinated by the fast fashion economy, the textile waste crisis, and our culture's response to all of that. My emphasis for my design and illustration work is with these topics and more social justice issues. This was my first zine, and at first I wasn't sure what to make it about. My friend Michelle forwarded me an opportunity for a zine swap, and my friend Bryan has been encouraging me to make one since I haven't before. So I thought with all these different factors converging, a zine would be a great way to share a topic I'm passionate about, educate others, and share something with my community. I've been recently doing some design personal projects around clothing lately (see my other blog post on the subject) so I thought it would be a great subject for my zine as well! #1: Opt for used/secondhand clothing first. The main way we can do better by the environment, our community, and communities around the world is by reducing the amount of stuff we consume -- that holds true for personal care products, disposable items, food (eating smarter/locally) and clothing. How we can do this with our clothes is by choosing clothes that are already in the consumer stream -- garments that others have already bought but no longer want. So this means going to your local thrift shop instead of Urban Outfitters (or insert any popular clothing store), or swapping clothes with your friends or colleagues. In general, it means making decisions to choose clothes that will last a long time, to shop less often, and to own less stuff. I wanted to note that buying used doesn't mean buying someone's dingy old underpants. What I particularly enjoy are vintage clothing shops, which I included in the zine (Afterlife in San Francisco, ReLove in San Francisco, Racks Boutique in Sacramento, Raggedy Threads in Brooklyn/Los Angeles, and Boro Resale in Detroit). Vintage means the clothes at these places are often decades old (I've seen early as 1940's clothing at Racks!) -- the owners of these shops often scour estate sales, antique fairs, or the internet to find unique items that they can then resell to the public. Vintage clothes tend to be much higher quality than present-day clothes; plus, they're often in a retro style that we don't see anymore. You can think of them as unique collectibles, where few other people in the world are likely to have the same item. As a result, the clothes at vintage shops tend to be more expensive since you're paying for a life-long piece. If you have a tighter budget or you enjoy combing through racks of clothes, you can buy from consignment stores like Buffalo Exchange or Crossroads Trading Co. Stores like these will buy (nearly any type of) used clothes from community members and resell to the public. Another option is regular used clothing stores like Goodwill. A word of advice is to look for the local version of these shops before going to Crossroads or Goodwill, because by shopping local your money goes back to your community instead of a larger corporate chain. #2. Buy new items mindfully. Is this product manufactured by an ethical company? Is this product manufactured in our country? Aside from working conditions, the carbon footprint of our clothing is dramatically reduced when it's manufactured in our country. Meaning, it doesn't have to fly overseas just to get to us. Hemp and linen: I included these as better options than cotton because hemp and linen are less resource intensive. They don't require nearly as much water as cotton and can last a lot longer. They're derived from natural sources, so they're also biodegradable. They take dye easily, which means less chemical run-off into water streams. Can this item be repaired if it breaks or tears? #3: Remember that ethical shopping is a journey. You might feel shocked, scared, overwhelmed, discouraged, or even invigorated as you get into this process. My own journey with ethical clothing has been a long one, supplemented by deep learning on the subject and years of practice. But I'm passionate about this subject and enjoy it so much because it's an exciting place to be as a consumer: deciding who you'll give your money to, how you want to dress and stand out, and what you want to do with your own agency. So I hope with this, you can feel some of that same vigor to learn, practice, and reach greater understanding. Good luck!! If you enjoyed this zine, please share it with a friend! They can get their own copy above or you can pass on your copy. You can also stay updated with my work by following me on social and/or subscribing to my newsletter.